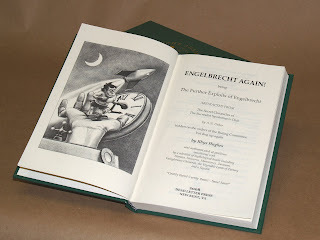 Here are some glamour shots of Rhys Hughes' new novel, Engelbrecht Again! (limited to 300 hardcover copies). The book can be purchased at select specialty booksellers, or order directly from Dead Letter Press by selecting one of the pay options to the right of these photos. I'll post photos of the book soon, but until then this scan allows readers to see the beautiful gold design stamped on the cover of Engelbrecht Again!, Rhys Hughes' most ingenious book yet. Books have begun to ship in this order: first, to all those who pre-ordered; then dealer orders will be filled; followed by review copies. Order Engelbrecht Again! today, before the lil' guy gets away. Engelbrecht is at the printer. The presses are rolling! Rhys' brilliant novel Engelbrecht Again! went to the printer a little over a week ago. Today, following the approval of the printer proofs, the presses started rolling! HERE COMES ENGELBRECHT! Rhys is currently busy signing the illustrated bookplates and everything is on schedule for an October 31 release. There's no stopping the dwarf! Engelbrecht Again! will be accompanied by a special archival bookplate signed by author Rhys Hughes. Oh, and lastly: Engelbrecht races to the printer this week! 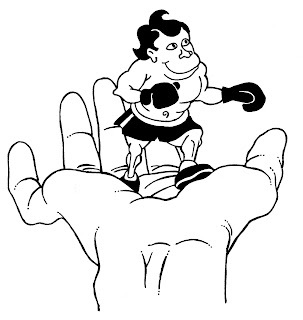 Engelbrecht is a dwarf surrealist boxer who does most of his fighting against clocks. His exploits were first chronicled by Maurice Richardson back in the 1940s in the pages of the esteemed Lilliput magazine. Engelbrecht is the most famous member of the Surrealist Sportsman’s Club, a very dubious society that spends the time it has left between the collapse of the moon and the end of the universe taking the concept of the 'game' to its logical limit, for instance arranging a rugby match between Mars and the entire human race, or playing chess with boy scouts and nuclear bombs as pieces. Sixty or so years after his first appearance Engelbrecht has returned for another set of exploits that will take him on a voyage around the world, into space, down to Hell, into a labyrinth of plots and counter-plots that could mean the destruction of the entire membership of the Surrealist Sportsman’s Club. Running the gauntlet with gorgons, competing in the mesmeric tour-de-trance bicycle race, climbing the north face of the largest ego in existence, playing tug-o’-war with entire continents and even indulging in a round of lipograms with the monstrous Père Ubu – all these are in a day’s work for the plucky Engelbrecht! 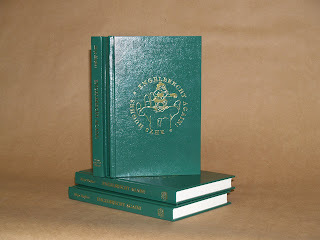 A beautiful 272-page Smythe sewn hardcover bound in green leatherette and stamped in gold. Engelbrecht gets the last word! 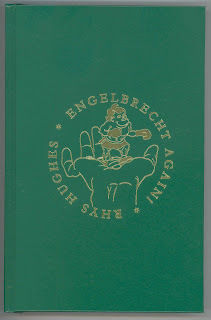 Dead Letter Press is excited to announce the publication of Rhys Hughes' humorous novel Engelbrecht Again! as a limited-edition hardcover. The book continues the outrageous adventures of the dwarf surrealist boxer created by Maurice Richardson in the late 1940's, but I must say, Rhys has seriously (a strange word to use in regards to Engelbrecht) ratcheted up the absurdity a healthy notch or two. Indeed, Rhys has outdone himself. It's taken Engelbrecht a few years to get this far, but it just goes to prove you can't keep the little fellow down! More details on EA! coming soon. E-Mail DeadLetterPress@cox.net if you wish to pay by check or money order.